So according to those that poll these sorts of things, 2015 was the year of salted caramel. And yes, we jumped on the bandwagon, because, well, it is a really delicious combo! : salted caramel pecan pie with pretzel crust, salted caramel macaroons, bacon bourbon salted caramel popcorn (known as crack-corn around here), salted caramel brownies and many, many more. 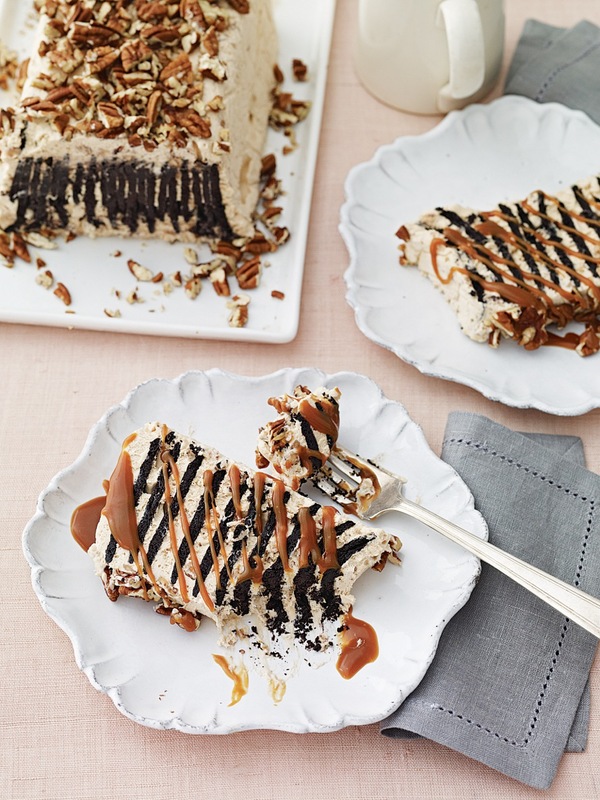 Here, Abby Dodge brings us an easy Salted Caramel–Toffee Icebox Cake from her new book The Everyday Baker. This is the perfect dessert to serve this holiday season when you need something sort of fancy but within the realm of comfort food. This is the recipe to make when you have to make a dessert and don’t have any time. This is the dessert to make if you like chocolate and caramel – and salted caramel in particular. In other words, make it today, tomorrow or any day of the week! You make a from-scratch caramel sauce and then it is simply an assembly of whipped cream and purchased cookies. Trust Abby. It works. Splendidly. Check out her Whole-Wheat Soda Bread with Pistachios and Apricots as well. Excerpted with permission. The Everyday Baker by Abigail Johnson Dodge. Published by Taunton Press, 2015. Having grown up with the cookies and sweetened whipped cream dessert fondly known as “icebox cake,” my goal was to re-create it into a contemporary, slightly more elegant dessert. For mine, I wanted an elevated flavor profile, but I didn’t want to lose the comforting texture and charmingly casual appearance. I also wanted to end up with a sliceable loaf shape to show off the zebra-style strips from the chocolate cookies. After some experimenting, I settled on a glass loaf pan and lined it with plastic wrap for easy unmolding. The resulting loaf has a structured shape even though the cookies can be added somewhat randomly and without extreme precision; unmolding is easy-breezy. After experimenting with whipped cream flavors as well as with different types of crisp cookies, I landed on my top three fave flavors to pair with the classic chocolate wafer cookie—coffee, caramel, and cinnamon caramel. Choosing a deep, rich caramel as the highlighted flavor (coffee and cinnamon– caramel options are given in Twists on the facing page) was a no-brainer, as the technique for making caramel is a classic that will serve you well throughout your baking years. Through testing, it became obvious that this dessert required ample make-ahead time (at least 36 hours) to allow for the cookies to soften by absorbing moisture from the cream. Topping the unmolded cake with toasted pecans and drizzling slices with some of the extra caramel sauce are the final touches. Make the caramel: Put the heavy cream in a small saucepan or microwave-safe bowl and heat until very warm. Set aside. Put the sugar and water in a medium saucepan. Cook, stirring, over low heat until the sugar is dissolved and the mixture is boiling, then stop stirring and increase the heat to high. When the sugar begins to caramelize, swirl the pan over the heat until the caramel is deep amber, 2 to 3 minutes. Gently swirl the pan over the heat to even out the caramel color. (I like to test the color by putting a drop or two on a white plate. If the caramel is too light in color, the sauce will be too sweet.) Slide the pan off the heat and slowly and carefully add the warm heavy cream. Be careful, as it will sputter and the steam is very hot. Whisk until the caramel is completely smooth. If necessary, return the pan to the heat and continue whisking until the caramel is dissolved. Slide the pan off the heat, add 1⁄2 tsp. coarse sea salt, and whisk until blended. Taste and add more salt, little by little, until the caramel is slightly salty. Refrigerate, stirring frequently, until chilled, about 60 minutes. For faster cooling, set the pan over a bowl filled with ice and a little water, stirring and scraping the sides frequently. (I use a 6-cup/1.4 liter Pyrex). Arrange two long pieces of plastic wrap in a cross pattern over the pan and press into the bottom and sides to cover the inside of the pan completely, allowing the excess to hang over the edges. Pour the heavy cream into the bowl of a stand mixer fitted with the whisk attachment (or in a large bowl using an electric handheld mixer fitted with wire beaters) and add 1 cup (240 ml) of the chilled caramel, reserving the remaining caramel for serving. Beat on medium to medium-high speed until firm peaks form when the beaters are lifted. Using a silicone spatula, gently fold in the toffee pieces until blended. Spoon about half of the caramel cream into the prepared loaf pan. Beginning at one short side, slide 10 cookies, one by one, into the cream about 1⁄4 inch (6 mm) apart along one short side of the pan. They will look like dominos. (If any of the cookies are broken, slide them in piece by piece to mimic a whole cookie. If they are broken into several pieces, use a fresh cookie.) Repeat with a second, third, and fourth row of cookies, sliding them in between the adjacent row so they overlap slightly (see the Essential Technique on p. 398). Gently press on the tops of the cookies. Top with the remaining cream, using the spatula to gently press the cream in between the cookies. Firmly tap the pan on the counter several times to settle the cream. Smooth the top (the tops of some of the cookies may peak out of the cream) and fold the excess plastic wrap over the top to cover completely. Refrigerate until the cookies are very soft, at least 36 hours. To serve: Peel back the plastic from the top. Arrange a flat serving plate on top of the loaf pan and invert. With one hand, firmly hold down the plastic while gently but firmly lifting off the pan with the other hand; peel away the plastic. Sprinkle the top evenly with the pecans. Run a thin, serrated knife under hot water, wipe it dry, and, using a sawing motion, cut the cake into 3⁄4-inch (2 cm) thick slices, heating and wiping the knife after every slice. 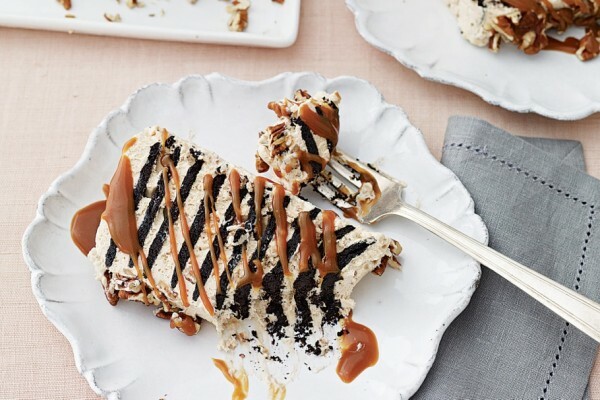 Serve with a drizzle of the remaining caramel. > The caramel can be prepared and refrigerated for 3 days. > The cake can be left in the mold and refrigerated for 2 to 3 days before unmolding and serving. > The cake can be unmolded and stowed, loosely covered, in the refrigerator for up to 4 hours before serving. > Coffee: Omit the caramel sauce. (23⁄8 oz./67 g) granulated sugar. Beat as directed, fold in the toffee pieces (or one of the options below), and proceed as directed. > Add chocolate: In place of the toffee pieces, use the same amount of chocolate-covered toffee pieces or finely chopped dark, milk, or white chocolate (mini chips are fine too) and top the cake with grated bitter- or semisweet chocolate (see p. 380) instead of the toasted pecans. > Cinnamon: Add 3⁄4 tsp. ground cinnamon to the caramel cream before beating.